– SHACK THOUGHTS — The Shack Project celebrates MMW @25 years! It’s been a busy couple of weeks, being on the road out of town for the Fridays, so I’m making it up a bit this week, sharing shows #24 & #25 for FAITU’s 25th week, the theme of which will extend over several weeks throughout the summer. Festival Int’l de Jazz de Montréal. MMW in Montreal, for this Canadian fan was a sweet deal. Unfortunately, I was unable to make it the first few times, but did catch a couple of the Montreal “events”. Each time MMW played Montreal it was a little special, at least to my ears. Always more than you might find from the trio at other festivals – not to say other festivals haven’t featured some killer MMW, which often depends on time slots, but Montreal seemed to always offer a good slot which afforded the band the chance to really put on an “MMW show”, rather than a more typical festival set. This week we’ll dig into the first Montreal Fest gig from 2000, and the following year’s return in 2001. Exploring some open space that’s really just a loose intro to Bone Digger – once again letting the Montreal crowd know that the trio is not just laying down your typically groovy funked-out festival set – they are here to find new sounds with this festival audience, and that’s what they do. MMW keep Digging the Bones – man this tune is wacked! – and this dying groove slides into the more upbeat Big Time and lets the band welcome the crowd with a bit more friendly sounds, and begins a run of some more groovier numbers that should get the crowd dancing. Big Time, always a nice big groove itself, moves into its outro as some Coconut Boogaloo emerges, coloured by some nice Medeski piano work, sprinkled with a small illyB solo, some raunchy bass fuzz from Wood, and joined by Logic near the end of the tune before we head into the PHAT groove of Jelly Belly – it’s THICK! 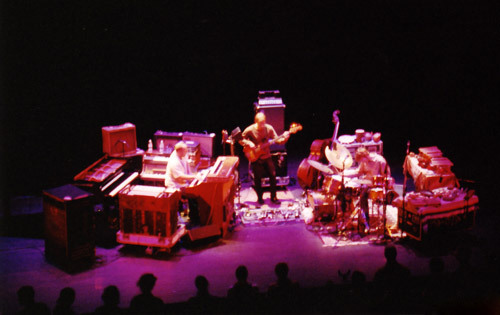 Some wonderful back and forth between Medeski and Logic on this tune before it busts into a Drum Solo … and interestingly, since he’s onstage, but Logic doesn’t join in with illyB … a few years previous, when Logic was a on tour more often with the trio he and Billy would regularly jam off one another when John and Chris dropped out. The sweet bassline of ITAHTLMJ pops up next, some wonderful screeching from John’s keys on the main theme, Logic jumping into the fray, while Billy propels us along. A solid take on the tune with Logic bits for intrigue, but then the tune drifts into some short open space exploration that leads us into the crazy Felic groove – it’s a weird tune and I love it for that reason; not easy listening. More wacky Open Improvisation follows Felic, and Scofield finally joins the fray in the aftermath, tinkering as his sound cuts right into the Open Space – he’s unmistakable, much to the chagrin of some, and to the joy of the rest of us. The overall sound thins out as Medeski, Sco and Logic trade some “licks”, illyB gets his talking drum in there, Chris plunks a little, and it all drops into The Dropper. For you Sco haters out there, just check out the imagination on this tune as he creates his own part throughout the song – this is NOT a tune Sco guests on, usually, but this is the 2nd – and last – time within a week, so he’s not oblivious to the song, but still! Very interesting to hear Sco’s input on The Dropper, vs. Ribot’s (plays on the album version and a couple of live performances). The guests remain onstage until the end of the show, but we’re back to some MMW live show tunes again, with first Note Bleu – another chance for comparing Sco’s input to Ribot’s album take – resulting in a hefty Bass Solo intro into the Hendrix tune, Third Stone From The Sun – again, Logic fits nicely in here, as usual, and cool to hear Sco’s take on the rock number. MMW’s take on the Hendrix tune is ALWAYS a treat! The Hendrix theme continues into the encore, and so do the guests, with a PUMPING Crosstown Traffic to close out the evening. 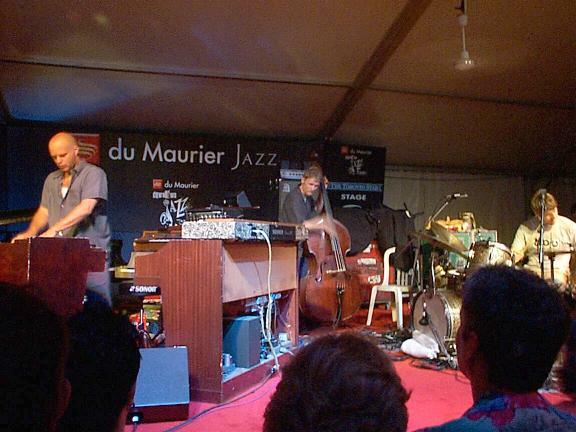 And so begins our run through MMW’s history at the Festival Int’l de Jazz de Montréal. As always, BIG THANKS to the tapers, and a special shout-out to Blane Harvey for all his work in getting Canadian shows taped and/or shared – as a fellow Canuck, I’m forever grateful, and I’m sure the other MMW Shackers are too! Not sure if you’re still out there, Blane, but next time MMW hit Montreal we gotta have a beer together!